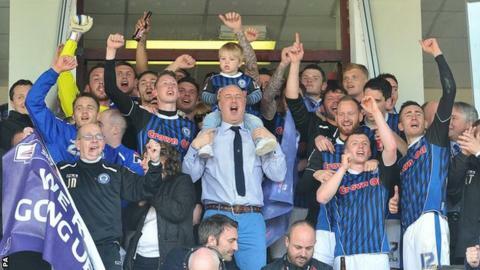 Manager Keith Hill is confident that promoted Rochdale will be competitive in League One next season. Dale guaranteed a top-three finish with a 2-0 home win against Cheltenham on Saturday, two years after being relegated from the third tier. "That's the real magic of what we've done this season. We've done it with a relatively small budget," said Hill. "We won't overspend next season but we will be successful. There's no question in my mind about that." Having been in the top three for much of the campaign, Dale's promotion challenge looked in danger of faltering in the final month with consecutive 3-0 losses to Mansfield and Southend. But they beat struggling Bristol Rovers on Monday and then defeated Cheltenham with early goals from Peter Vincenti and Ian Henderson to confirm their spot in League One next term. Hill led Rochdale to promotion in 2010 during his first spell at Spotland and guided them to ninth in League One, the joint-best finish in the club's history, a year later before leaving to join Barnsley. He was dismissed by the Tykes in December 2012 after 18 months as manager and was back at Rochdale shortly afterwards, with automatic promotion achieved in his first full season since returning. The 44-year-old told BBC Radio Manchester: "It was a magnificent day. In any campaign, you want to be successful. To get promoted is as big a success as you can get. "As soon as the job became available, it was something I wanted to do. I wanted to go back and reinvigorate performances on the pitch and recreate what we did in the first place, which was give unrivalled success to the supporters of the football club. "We've achieved promotion in our first full season and we're looking forward to League One now."